It's probably a safe bet that someone's going to get a kick out of playing as and against stars like Roger Federer, Andy Roddick, and Maria Sharapova. There are a number of other real-world tennis celebrities who are playable, too, including a few retired champion players like Monica Seles and Boris Becker. These athletes show up in the tougher portions of the game, and they're hellishly difficult to face. It's actually easier to play the game's online mode, because other players aren't as infallible as the opponents in Top Spin's career mode. There are different online modes, ranging from quick matches to comprehensive tournaments that literally last for weeks. It's actually a bit surreal to play an opponent online, as their errors during play and the (extremely impressive) graphics make these tennis rounds look and feel like you're watching a real match on TV instead of playing a game. It's weird, because the character models themselves don't look quite so detailed when they are shown up close, but they move with the realistic physicality that makes them look convincing from a distance. Combine these things with the realistic sounds of the crowd in the background, and things quickly begin to descend into the Uncanny Valley. 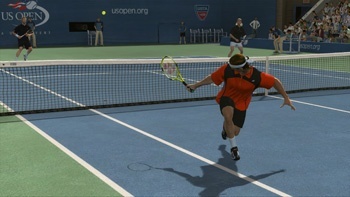 All things considered, I expected to hate Top Spin 3, mainly because I've never really been a fan of tennis. What I encountered, though, was a well-made game that delivers an incredibly immersive experience that actually felt like I was watching a real tennis match. Bottom Line: Top Spin 3's a fantastically well-put together package, featuring a lot of depth and strong multiplayer modes. But, remember: it's also a tennis game with an incredibly steep learning curve. Recommendation: Buy it: If you're a fan of sports games, you'll love this. If you're not, then I doubt you're even reading this review. Aaron Stack isn't really here. He's just a product of your imagination, telling you what you should already know.